22-year-old Samuel Meme from delta State has been arrested for allegedly robbing a Portuguese couple in Ijora Lagos traffic. The former scrap metal collector stated that he targeted and robbed cars whose occupants were busy using their phones while in traffic. 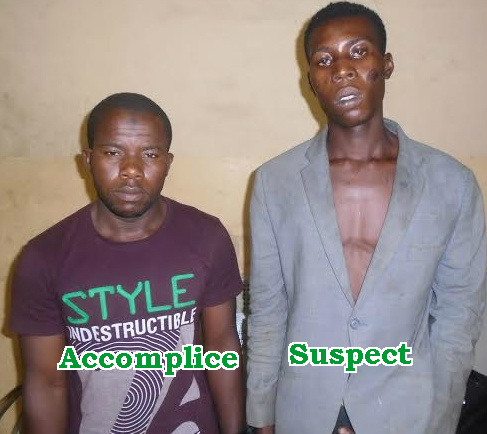 He was arrested alongside his accomplice on Saturday morning shortly after robbing a Portuguese couple and occupants of another vehicle in traffic at Marine Bridge in Ijora. THESE DOGS WOULD NEVER CHANGE!!!! I CALL THEM DOGS BECAUSE THEY ARE NOT ACTING WITH REFERENCE TO THE NATION’S DIGNITY…. DOGS. Thank God they were caught cos these are d people giving us bad name in these country.